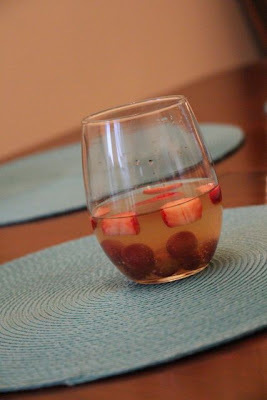 This sangria recipe, which I made most recently for brunch after the marathon, is phenomenal. The recipe is simple: wine, peach schnapps, frozen lemonade concentrate and fruit. The frozen lemonade makes the drink sweet, and the schnapps gives it good fruit flavor. Your early-morning alcohol shouldn't be overwhelmingly booze-tasting, right? I got this recipe from Camille a couple of years ago, and it's never failed to impress. It's the best sangria I've ever had, for sure. In a large pitcher, combine wine, schnapps and lemonade concentrate. Add fruit. Refrigerate 2 hours or overnight to blend flavors.